Repurposing drugs does not only involve the use of old drugs in new indications—it also can involve taking an existing molecule and making modifications to its structure, creating a new chemical entity that is safer or more effective in its original indication or in completely new and unrelated indications. This is a promising area of medical research. It’s been known for some time that heparin, the most widely used anticoagulant drug in the world today, has anti-inflammatory properties. For decades, physicians who have treated people with deep vein thrombosis have noticed that after beginning treatment for thrombophlebitis, the patient’s leg quickly feels better—not because the clot in the leg has dissolved but because the heparin has a systemic anti-inflammatory effect. In recognition of heparin’s anti-inflammatory effects, clinicians have attempted to use heparin as a treatment of inflammatory disorders ranging from inflammatory lung diseases such as asthma, chronic obstructive pulmonary disease (COPD) and cystic fibrosis, to inflammatory bowel disease, to even putting heparin on burns for its anti-inflammatory effect. 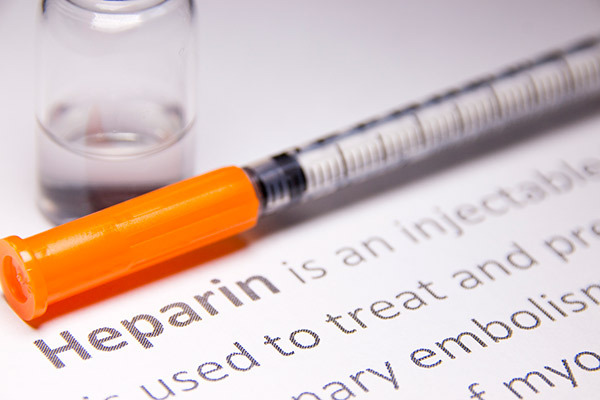 However, at the doses at which heparin has an anti-inflammatory effect, there is also a potent anticoagulation effect that could result in serious or life-threatening internal bleeding. Similarly, it has been suggested for decades that heparin might also have an anti-cancer effect, though at doses that would likely not be safe to administer. The insight at Cantex was that if one could modify the heparin molecule so that it still has the robust anti-inflammatory and anticancer effect while losing its anticoagulant effect, you might have a new and novel therapeutic entity. Cantex scientists discovered that if the heparin's 2-O-sulfate and 3-O-sulfate groups are removed, the derivative molecule cannot bind anti-thrombin and therefore, cannot effectively anticoagulate, resulting in a molecule which has almost identical anti-inflammatory and anticancer activity, while having only a very tiny fraction of the anticoagulant effect. That low anticoagulant derivative of unfractionated heparin is being developed under the name CX-01. CX-01 has been taken into the clinic in cancer and an interesting and unexpected effect of CX-01 was discovered: it appeared to accelerate platelet recovery after high-dose chemotherapy. Later, Cantex discovered that CX-01 also appears to accelerate platelet recovery in preclinical models after total body irradiation. This was probably not discovered in the past with any other form of heparin because the doses of the very low anticoagulant CX-01 that Cantex is able to give are far higher than any dose of unmodified heparin that could be safely administered. With that information and suggestions from preclinical studies that heparin may enhance the efficacy of chemotherapy for leukemia, Cantex began a pilot study in patients with newly diagnosed acute myeloid leukemia. These patients would receive the standard chemotherapy which is known by the nickname of the 7+3 regimen, which means 7 days of cytarabine and 3 days of either idarubicin or daunorubicin, in conjunction with a 7-day infusion of CX-01. Cantex believes the combination of CX-01 and the chemotherapy could have two effects. The first is to drive the leukemia stem cells out of the bone marrow into the peripheral circulation through well-defined mechanisms including inhibition of both the CXCL12/CXCR4 axis and selectins, which may be involved in the protection of leukemia cells from the killing effects of chemotherapy. There was also a suggestion that CX-01 may enhance the efficacy of chemotherapy by inhibiting the activity of HMGB1, a cytokine that is released when cells are damaged, and that has been implicated in the resistance to chemotherapy. In that pilot study, in which 11 patients with newly diagnosed primary AML were treated with the 7+3 in conjunction with CX-01, 100% of the patients achieved complete remission with a single cycle of chemotherapy. Based upon this encouraging data, Cantex has initiated a randomized Phase 2b study with newly diagnosed AML combining 7+3 with one of 2 doses of CX-01 or with no added CX-01. Cantex expects results from this study in early 2018. In addition, an investigator-initiated study is in progress in myelodysplastic syndrome in patients who have had an inadequate response to the current standard therapy with hypomethylating agents; Cantex expects that study will have a readout in 2018 as well. Beyond Cantex’s research into CX-01’s potential therapeutic effects in hematologic malignancies, several centers in the United States have entered into collaborations with Cantex to explore the potential activity of CX-01 in a broad range of diseases where CX-01’s biologic activity may have a treatment effect, including, but not limited to, traumatic brain injury and cystic fibrosis. The exciting developments we’ve seen with CX-01 are a reminder that modifying existing molecules is an area of molecular engineering that can yield interesting, and potentially effective, new drug candidates. These new chemical entities have the exciting possibilities attached to an entirely new molecule while also building upon previous research and clinical experience. Stephen Marcus, M.D. (smarcus@cantex.com), is the CEO of Cantex Pharmaceuticals.